I promised a video tutorial for this style exactly one year ago. Time flew by way faster than I imagined but I’m excited to finally be sharing it today. 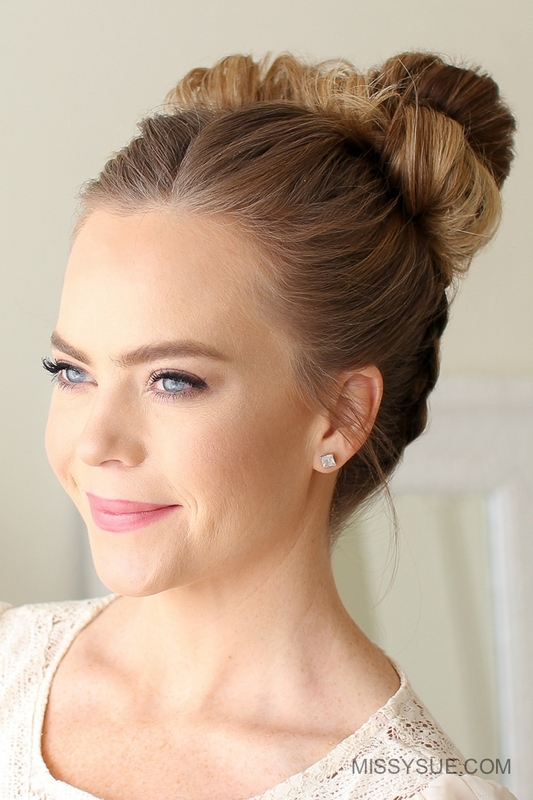 This hairstyle incorporates two braids trailing up to two little messy buns and it’s a lot easier to do than you might think. My favorite tip is flipping your head upside down so the hair stays out of the way as you braid. “Space Buns” was one of my very favorite styles in middle school. 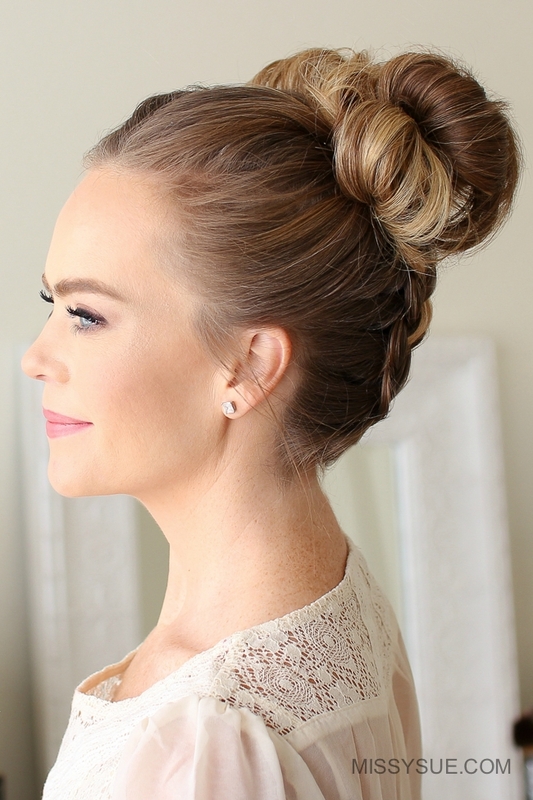 It was my go-to whenever I was in a pinch and needed to throw my hair into something cute. This a really fun way to style your hair for the gym, especially with the braids, and would easily transition into an everyday style. I hope you enjoy the tutorial and be sure to let me know what you think down below in the comments! Step 2 / Then part the hair down the back of the head creating two halves. Step 3 / Then tie off one side. Step 4 / Next flip your head upside down and pick up a small section of hair at the nape of neck, dividing it into three sections for the braid. Step 5 / Begin a dutch braid by crossing the right strand under the middle and then the left strand under the middle. Step 6 / Now cross the right strand under the middle and then pick up a new section of hair crossing it under the middle as well. Step 7 / Then do the same thing on the left side crossing the left strand under the middle and bringing a new section into the braid. Step 8 / Repeat those steps crossing the side strands under the middle strand and working up the head. Step 9 / Once you’ve brought in a section of hair at the top of the ear then just braid the section a little further down in a regular braid. Step 10 / Cross a bobby pin over the bottom of the braid so it doesn’t unravel. Step 11 / Then do the same thing with the hair on the left creating a second dutch braid, adding in hair until the braid reaches the ear and then braid a little further down and cross a bobby pin over the end. Step 12 / Next combine all of the hair on the right side together and wrap a hair band once over the hair and then twist it over your dominant hand. Step 13 / Remove the bobby pins from the ends of the braid and carefully unravel it. Step 14 / Now flip the ponytail forwards and spread it around the hair band to form the base of the bun. Step 15 / Then wrap the hair band twice more over this base. Step 16 / Then gently pull on the edges to make it a little bigger and tighten it against the head. Step 17 / Now do the same thing with the hair on the left side, creating a little bun next to the first one. Step 18 / With the ends left sticking out, loop them back towards the hair band and tuck them in creating another loop. Step 19 / Then bobby pin down any pieces that are sticking out and go back over the braids pulling on the edges so they’re wider. Step 20 / Then set the style with a medium-hold hairspray.